He's grown into a leader at the San Antonio Spurs, now Patty Mills wants to lead the best ever Australian team. And lead them to be the world's best. To say Mills is excited by the prospect of playing for Australia in front of 50,000 fans in Melbourne – twice – is an understatement. 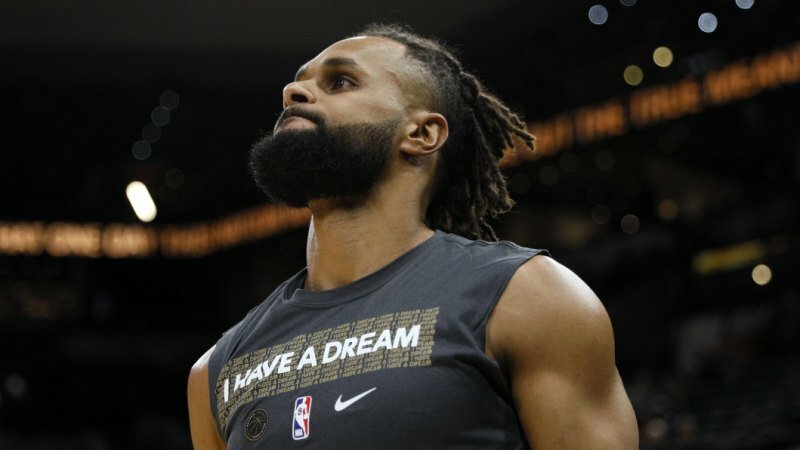 Canberra’s Patty Mills wants to lead the best-ever Boomers to be the best. Credit:Soobum Im-USA TODAY Sports. With 11 Australians playing in the NBA so far this season, Mills said the Boomers were becoming a powerhouse of world basketball. The 30-year-old is a leader of the Spurs, who are going through a tough, transitional season, and he would love to lead an Australian team boasting four players with NBA championships under their belts, Australia's first ever NBA All Star and one of the best shooters in the league. Aron Baynes, Andrew Bogut, Matthew Dellavedova, Joe Ingles and Ben Simmons. Why wouldn't you. He felt the tough run his Spurs are going through will only help him in his goal. "There's no question mate. Being a leader of the Boomers team is something that I've felt responsible for and being able to learn from the amount of guys that I've been able to – not only on the Boomers in my early days, but also over here in the NBA," Mills said. "I felt like the leadership education path that I've taken has fitted me quite well for this role with Spurs and also on the national team. "To be able to lead an Australian team as well, and the best ever Australian team, I feel very fortunate, but you look down our list and the amount of veteran guys that we have and experience and NBA championships and All Stars we're in pretty good hands." Once the NBA season's over, Mills wants to do a similar job with the Australian team and accomplish what no men's team from this country has – win gold at the worlds and Olympics. That starts with their world championships warm-ups against the USA later in the year. There's already been 90,000 tickets sold across the two games, meaning they're just 10,000 away from two full houses in the normally-for-AFL stadium. "We're excited to put together Australia's best ever team. Our team will possibly consist of four players with NBA championships – myself, Aron Baynes, Andrew Bogut, Matthew Dellavedova – one of the best shooters in the NBA as we speak in Joe Ingles, and for the first time ever an NBA All Star in Ben Simmons," Mills said. "Also I believe there's 11 Aussies who have stepped on an NBA court this season, which is a massive accomplishment. "When you look at our team on paper there's no question that we have turned into a basketball powerhouse. "We as a group fully believe in our team's goal of winning a gold at the world championships and also the Tokyo Olympics. "We want to be the best team in the world and we are absolutely licking our chops about the opportunity for sure." But the games against the USA aren't just important for the development of the Boomers. Mills felt it was important for the game of basketball in Australia. The sport's enjoying a renaissance in this country after a few tough years and Mills felt these games would definitely help that. "It's huge for our team's development to get to the world championships, but when you look at it from the other side of what this can possibly do for basketball within Australia from our youngsters all the way to the NBL," he said. "You get goose bumps on your hands just knowing you have an involvement in that. It's an amazing opportunity on all accounts." Tickets available for Australian Boomers v Team USA from Ticketmaster. Games at Marvel Stadium, August 22 and August 24.